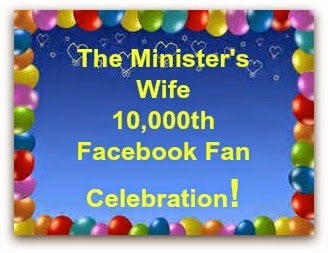 Congratulations to The Minister's Wife for reaching 10,000 Facebook Fans. She's celebrating with a giveaway with 10 prizes, one for each thousand. She's the "I" in the text below. The giveaway runs through 8/10/14 and is US only. I am celebrating 10,000 amazing Facebook fans, and as a thank you, I am having a big giveaway for all of you! It is so exciting to see some of the wonderful prizes below that you can win. Enjoy the celebration! There will be 10 winners! YAY!! ZINK hAppy Smart App Printer™ hAppy is the portable, Wi-Fi®, app-accessory that allows you to print directly from smart phones and tablets. Just download the free ZINK Design & Print Studio™ app onto a smartphone or tablet (or use a 3rd party compatible app); load a ZINK zRoll™ (photographic-quality ZINK Paper in roll form), design, and then wirelessly print to the hAppy. It’s compatible with iPhone®, iPad®, and iPod touch®. hAppy is also compatible with Android™ smartphone and tablets and Amazon Kindle Fire™ tablets. Take a look at this video to see how it works. It's amazing and so much fun! Like memory foam but concerned about its hot reputation? You'll love our CoolFit™ Foam bedding. A breakthrough in sleeping comfort, gel technology enhances memory foam to create a cool, comfortable sleep experience. In addition, an exclusive wave design lets air flow freely through zones that move as you do. Hypoallergenic. 300-thread-count cotton cover. Also available in classic shape. CoolFit Memory Foam Contour Pillows are made in USA of imported materials. The MIRA Kitchen Scale is the ultimate kitchen tool that not only looks great and works like a charm, but also makes your life in the kitchen so much easier! The perfect replacement for measuring cups. Use one container and the TARE feature to measure out all ingredients for a recipe. Sleek looking scale that occupies very little drawer space. Looks great when left on the counter. 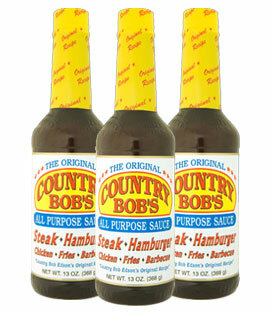 Large easy to read display offers three weighing options: grams, pounds or ounces. Easy-breezy stainless steel platform on food scale wipes clean with little effort. Accurate measurements in 1g/0.1 oz increments. Precise and consistent readings make MIRA digital food scale the perfect digital food scale for Weight Watchers members. TARE function ignores plates and dishes; weighing only the food inside. This makes the Digital kitchen scale versatile. Measures up to 11 lbs / 5 Kgs. Long-lasting lithium battery included for instant use upon arrival. Bulu Box is the best way to discover health, nutrition and weight loss products. Each monthly sample box is filled with 4 to 5 premium products selected to help you feel your best. Look forward to a new mix monthly for both women and men that include: vitamins, weight loss, energy, protein, digestion, sleep support, fitness DVDs, healthy food utensils and more. Earn an easy 50 points ($5) or more each month by reviewing, sharing and completing short surveys. Use your Reward Points to purchase full-size version of the products that work best for you! Subscriptions are 1, 3, 6, and 12 months. In this gift basket from Boogie Wipes you will receive 1, 90 ct canister of Fresh Scent Boogie Wipes, Kandoo Wash Your Hands, Kandoo Foaming Hand Sanitizer 8.4 oz and 1.7 oz, Boogie Wipes Gentle Saline Mist, Kandoo Detangler, 30 ct Great Grape Scented Boogie WIpes, and a Boogie Wipes t-shirt all in a fun green storage basket! 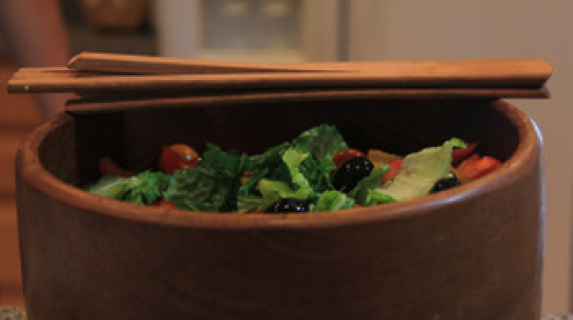 Brilliantly designed handmade one handed wood salad tongs. Designed and crafted in Kentucky. The unique design makes it easy to serve pasta, steamed vegetables, hot bread and salads with one hand. Great for buffet lines! Steam heat and pressure have been used for centuries to bend wood into useful shapes like chair backs or musical instruments. Each pair of tongs is hand steamed and bent into shape until cool to create distinctive springs. These springs keep the tongs open for the user, and allow them to fold flat for storage. 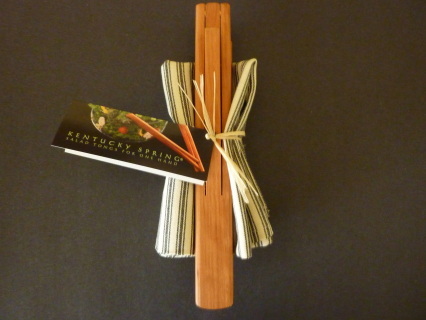 Handcrafted from reclaimed domestic hardwood, each tong is 11" long x 1.5" wide. WHO IS KENTUCKY MADE & MORE? Kentucky Made & More is an online retailer of high quality, sensibly priced items for gifts or personal use. We specialize in products handcrafted in Kentucky and the surrounding areas. Visit us at www.KentuckyMadeandMore.com or at one of the various events we participate in. Power Man and Iron Fist #72 [1981: Months before, Iron Fist's foe, Chaka, was imprisoned. Who has now taken on his identity? The new Chaka is murderous and without honor . . . the original [and repentant] Chaka begs his brother, and Power Man and Iron Fist, to stop the imposter. Walt Disney's Snow White and the Seven Dwarfs : The magazine sized extra length adaptation of the Disney cartoon film classic, this golden anniversary edition includes a Snow White poster! Spider-Man #1 : The hottest new comic of that year, written and drawn by Todd McFarlane, this comic had a total print run of around 6 million . . . which ultimately drove the value down, since it was in no sense rare. Well, a couple of the later printings are valuable, but this is the first printing, pretty common, but still . . . a cool bit of comics history and a nice Spider-Man cover [unless you dislike spiders, as Lois does, because the art includes about 3 dozen of them]. Sealed, bagged newsstand edition. Mr. T and the T-Force #1 : Yes, that Mr. T, leading a group of youths determined to tackle "real problems of the streets" with cleverness, courage, and the inimitable awesomeness of Mr. T -- who had a heavy amount of input in the stories, and swore that his character would never use guns. Artwork by Neal Adams. Sealed, bagged edition, includes trading card. Thanks to all the sponsors of the giveaway and all the bloggers who have helped to promote it! Open to US Residents only. Must be 18 or older to enter. Limit one entry per household/address. All entries will be verified. Winner will have 48 hours to respond to winning notification if no response, then another winner will be chosen. Contest ends at 12:01 AM 8/10/14. The Minister's Wife Stamps and Saves is not responsible for the delivery of the prize. The company sponsoring this giveaway is solely responsible for the delivery of the prize to the winner(s). The Minister's Wife Stamps and Saves is not responsible for lost or misdirected emails or physical mail. This giveaway is in no way administered, sponsored, or endorsed by, or associated with, Facebook, Twitter, Pinterest, Google, Instagram, or any other social media. Void where prohibited by law. I saw the giveaway on my Bloglovin feed from several bloggers. Congrats! I saw this on bloglovin. Yay! 10,000! I shared about the giveaway on google+ on 8/4. My username is reidsrd@hotmail.com. I follow your blog on social media and by email. I'm not sure where I saw it first but more than likely it was from the email is where I learned about this giveaway. Online sweepstakes.com is where I learned of this giveaway. I shared about the giveaway on google+ today, Monday August 4th. My username is reidsrd@hotmail.com. I learned about it from the Java John site. I saw this on Sweepstakes Advantage. I shared about the giveaway on google+ on 8/9 at 12;51am cst. My username is reidsrd@hotmail.com.